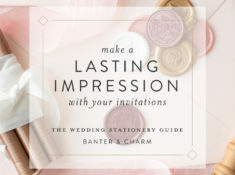 Traditionally, no rsvp card was included (or a blank card was used) with an invitation— guests knew they were expected to respond to the host as to whether they would attend the event. These days however, it is common to include a response card (along with a stamped and addressed envelope). The wording you choose depends on what sort of response you require from your guest: how many people will attend, the meal choice they prefer, or you may also want to find out who will attend another wedding event that same weekend, e.g. a welcome dinner or farewell brunch. You may also want to consider assigning a number to each guest and lightly marking that number on the rsvp card in the event a card is returned with an illegible name or no name at all! RSVP is an abbreviation for the French term “répondez s’il vous plait” which translates to “please reply”. (it’s redundant to put “please” or “kindly” before “RSVP” so skip it, or use “please reply”) If you used the old English spelling of “honour” on your invite, use the corresponding “favour” here. Make sure to include a response deadline for your guests. It is traditionally three to four weeks before your event, but you may want to adjust the date if you need to give your venue or caterer a headcount earlier. Include a line for your guests to write their names. Traditionally, an “M” (for Mr., Mrs., Miss, Ms) is included at the start of the line. 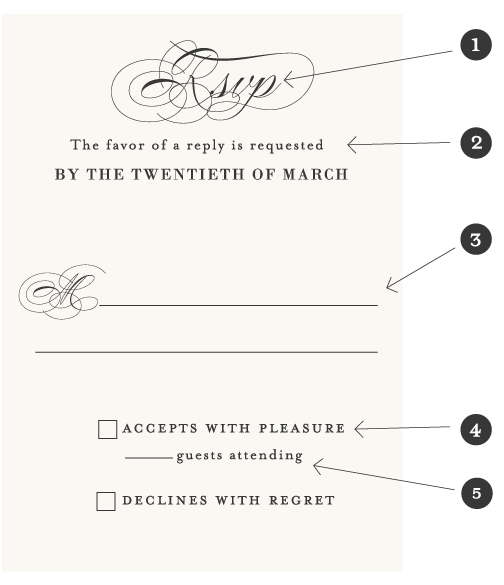 Provide a check box or line so your guests can note if they will or will not attend. You could also to include space for guests to indicate how many people are attending. If you’re offering a meal choice, you can add a place for guests to indicate their preference. You might also ask that guests list any food allergies. 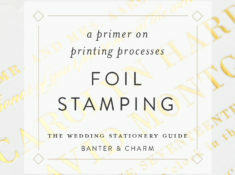 The following wording samples would be perfect for a traditional or formal wedding. 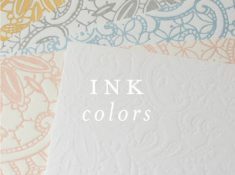 Hopefully these tips and sample wording cleared up any confusion and maybe even solved your RSVP card wording dilemma! If you have more questions, let me know – I’m happy to help out. 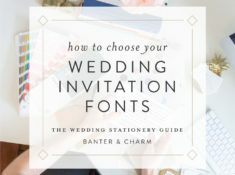 Next week in The Wedding Stationery Guide, I’ll be sharing wording tips and etiquette advice for the next piece in your wedding stationery suite: the reception card!